But the great majority of Canadians will not tolerate any theory that this country or its chief founder practiced or countenanced any plausible definition of genocide ever or anywhere1. We forget everything. What we remember is not what actually happened, not history, but merely that hackneyed dotted line they have chosen to drive into our memories by incessant hammering2. When TRIBE, a centre for evolving Aboriginal visual, media and performing arts, presented Dana Claxton’s Buffalo Bone China in 1995 as their inaugural project, the Canadian art world – and the larger world it sometimes inhabited or eschewed – was radically different. Claxton’s Revisited, that was on display in Saskatoon this Spring to mark TRIBE’s twentieth anniversary, had a reception almost concurrent to the release of the Truth and Reconciliation preliminary report. One couldn’t help but become introspective. 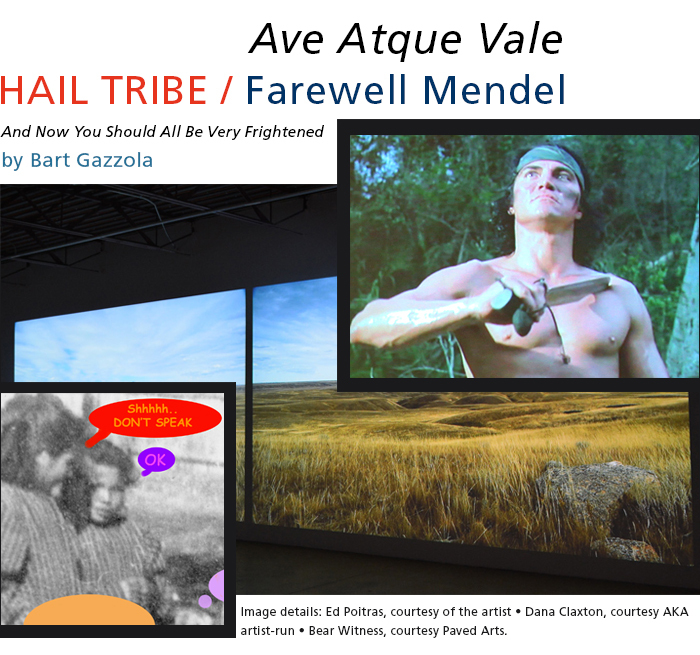 That another exhibition presented by TRIBE as part of their anniversary, The Fifth World, was the last exhibition at the much loved Mendel Art Gallery before its closure to foster preparations for the Remai Modern, also fed this thoughtfullness. I’d also recommend my conversation with Ruth Cuthand regarding her exhibition Don’t Drink Don’t Breathe, which is about Attiwaspkikat and media narratives that are less factual than forceful. You can download / listen to it here.